I figure if Nick can be a fashion reviewer, I can be a food critic. Right? While not chronicled here, I have had a long and intense devotion to beef jerky, starting when I was 11 and needed a snack on my paper route (it was a country paper route and was about 7-8 miles total distance for about 40 paper deliveries). If there is any food out there that is more perfectly aligned with the EDC mentality than jerky I don’t know what it is. It is a food that provides a lot of protein, it is capable of being stored and carried in a wide variety of climates, and, like all things EDC, there are entry level jerkies, good mass produced jerkies, and then high end stuff. There is even a website, www.bestbeefjerky.com that has a nearly comprehensive archive of written reviews of jerky (sound familiar?). And since this is a review, it makes sense to include at least one ratio. How about this: jerky:food::EDC:tools. For my money the best jerky I have ever had is from Jeff’s Famous brand. In particular I really like their Jamacian Jerk. I also like biltong which is a form of jerky from southern Africa (because yes jerky is a worldwide phenomenon). My favorite biltong is Biltong USA’s Traditional Sliced Biltong. 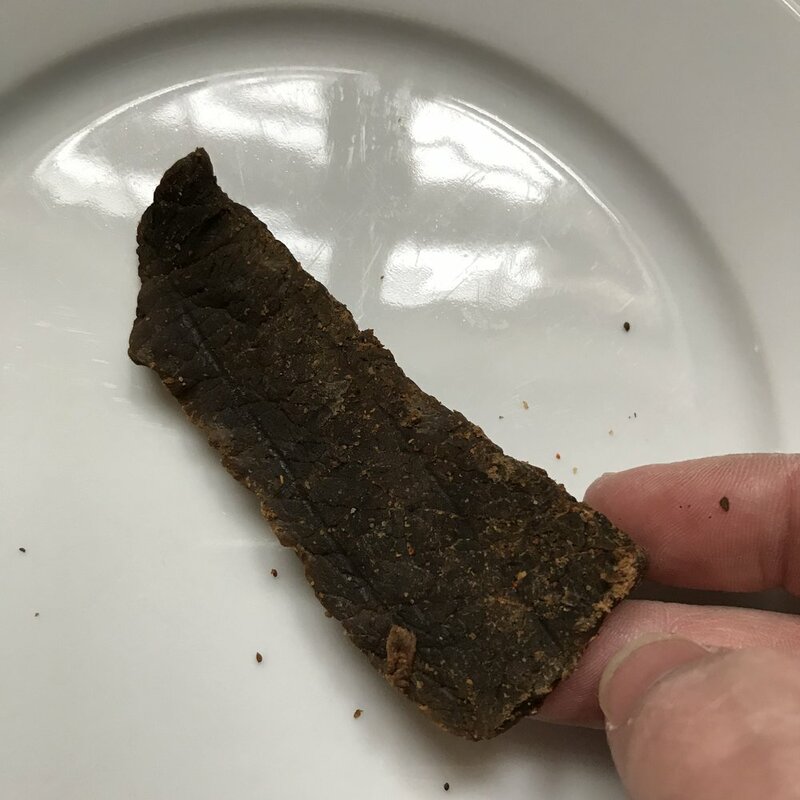 Jerky (genus: Jerky; species: Beef, Venison, Chicken, Turkey Jerky) of course ranges in quality from heavenly slices of favored meat to something akin to wax or appropriate only for dogs. If it is offered in a 4 pound bag at the checkout at Wal Mart, its not worth the money or the intake of sodium and preservatives. But the good stuff is TOTALLY worth dropping dough on even at the exorbitant prices that jerky commands (the high price is usually the result of lots of time-intensive labor). 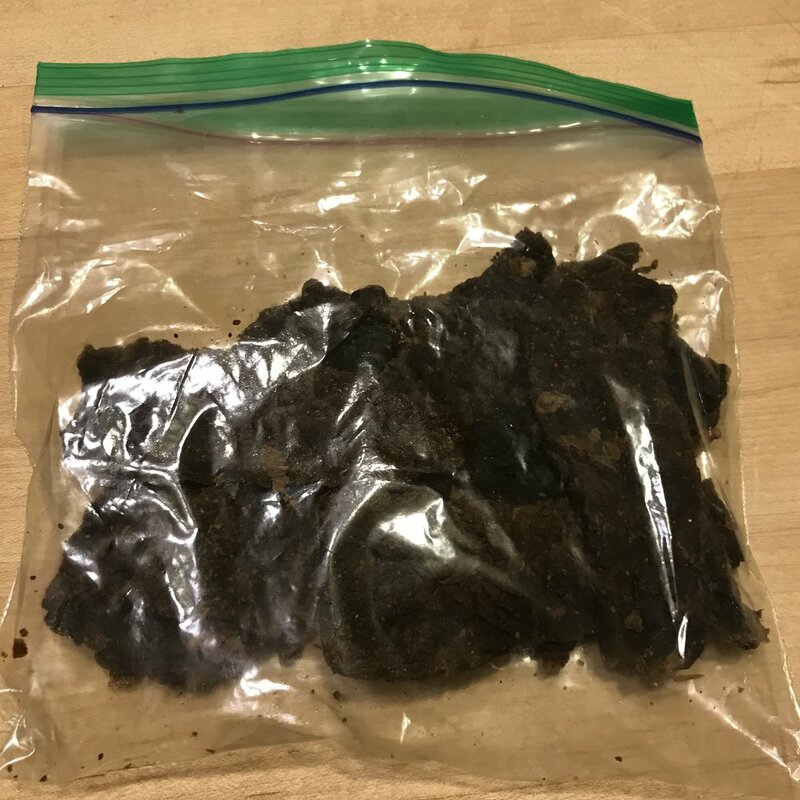 Recently one of the IKC’s more colorful and outspoken voices, Mr. Scurvy, has started selling small batches of jerky on his Instagram feed (DM him there if you are interested). The batches come out at random and the price is $5 an ounce, plus $5 shipping. Mr. Scurvy and I have been friends for years, every since we did a Point/Counterpoint on Gear Geeks Live, which he soundly won. He has also helped out with Blade coverage in the past. I mention out of full disclosure. That said, he did not know I was doing a review of his jerky until AFTER he sent it to me. As is usual, he has not seen this written review prior to publication. I missed out on the first batch or two, but when a batch came up in the first week of January 2019, I Paypal’d him some money. A few days later a sizable number of slabs arrived in a small ziplock baggy. My wife is used to me getting packages for review, but when I pulled out the baggy she asked me if I was reviewing marijuana now (Answer: No, but this site is). Over the next few days I chowed down on the jerky on long drives and around the house while finishing up a woodworking project. The jerky was excellent, with a texture, smell, and taste that hung with the best I have had. Importantly, and unlike with cheap jerky, there was still a real meat flavor. The spices were present, but never in front of the beef flavor. The spice mix on my batch was simple, Old Bay (which is usually a sea food spice mix), and the spices complemented each other nicely. I could definitely taste the black pepper and the celery salt, with the combination giving the jerky a crisp vegetable note under the beef. No one flavor pushed the others around or dominated my palette. The other nice thing about Mr. Scurvy’s jerky (BTW, this is probably not a good trade name—you can’t sell food with a food-related disease as the brand name, and yes I know food, specifically limes, CURED scurvy, the I am not sure that connection is the first people would make) was the beef itself was extra lean. A lot of jerky, if not waxy, is fatty and the flavors can get mixed up. Too much fat in jerky makes the spices and flavoring dominate over the meat flavor as the fat absorbs the spices but has no meat flavor. The cuts were also nice cuts with nothing that was stringy or hard. The jerky was also not greasy at all, which is hard thing to pull off. My fingers were coated with a light dusting of spices when I finished, but nothing else. Finally, the paprika was there, but never an obnoxious zing like it can be with some foods. Overall, I was impressed. If I had opened a bag of Jeff’s and these delicious meat cuts fell out I would have not suspected a thing. Mr. Scurvy’s jerky sits nicely among the best jerkies I have eaten. This jerky is HIGHLY RECOMMENDED. It is nice to see really great jerky come from an unexpected place and this is a reminder that anyone can cook. And yes, I need to work on my food photography skills as embark on my journey as a food critic.